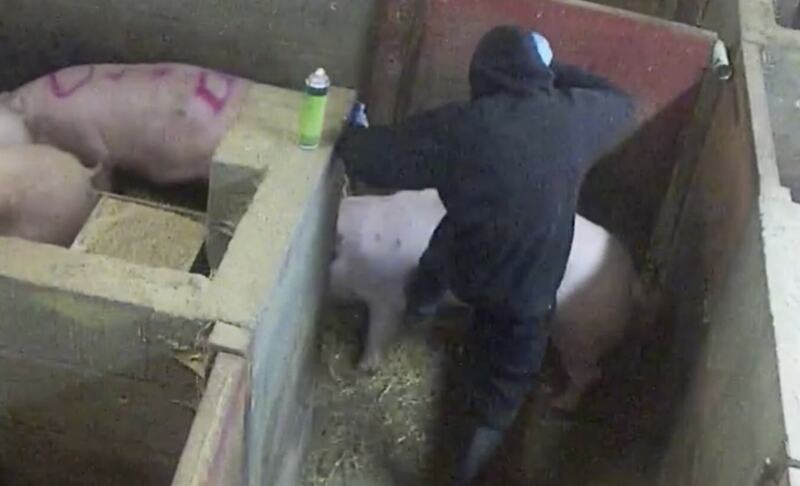 Horrific undercover footage of a pig farm in Lincolnshire shows pigs being beaten and abused by workers. The footage - obtained by leading international animal protection organisation Animal Equality after an anonymous tip-off - was taken at Fir Tree pig farm. Investigators made multiple visits during April this year, and placed hidden cameras in the buildings where violence had been reported. The facility, which houses 10,000 pigs, is owned by The Godfrey family alongside Elsham Linc – one of Britain's largest pig producers. The disturbing footage shows workers kicking pigs in the face and head violently and repeatedly with over 100 incidents of kicking recorded in 10 days, workers spraying marker paint directly up a pig's nose and laughing about the abuse. Workers were also shown jabbing pigs repeatedly with the tines of a mucking out fork, transporting an injured pig in the bucket of a tractor and hitting him/her, and leaving a 'downed' pig without veterinary care for 48 hours before shooting him/her. Animal Equality also documented dozens of pigs with severe tail biting wounds, some critically infected, as well as many heavily scarred pigs and several with hernias. Dr Toni Shephard, Animal Equality's UK Director, said: "While intensive pig farms are inherently pitiless places, the brutality inflicted on these poor pigs is incomprehensible. "The workers show complete contempt for the animals in their care and seem immune to their suffering, even when the pigs scream in pain. We demand that they be brought to justice. "Consumers can help end this cruelty by trying the increasing variety of plant-based foods available in shops and restaurants - which are often healthier than meat as well as cruelty-free." The Godfrey family told Sky News that they were 'shocked' by the events at their own facility, adding: "Their abhorrent behaviour does not represent our business. "We are a family-run farm where the care and welfare of our pigs is paramount. "We have been able to identify the four individuals in the film and following an immediate investigation their employment has been terminated."